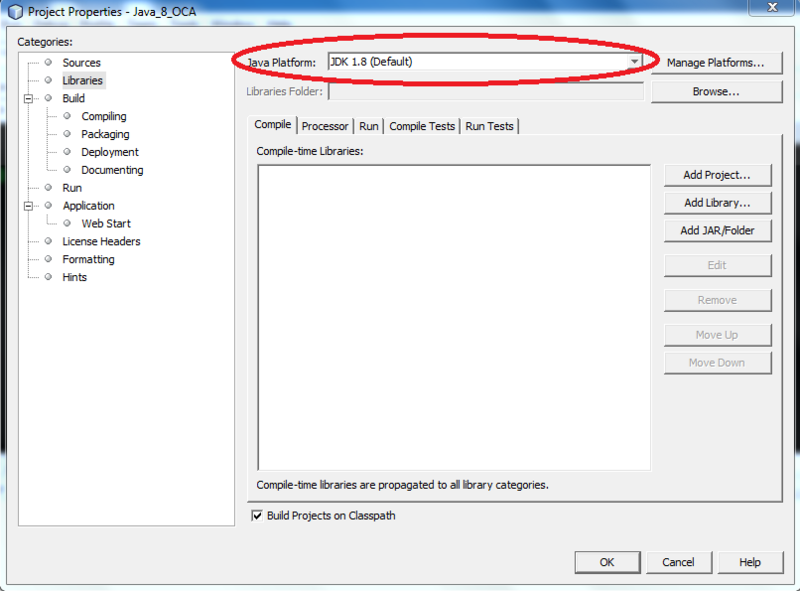 How to set the JDK Netbeans runs on? "Cannot locate java installation in specified jdkhome C:\Program Files (x86)\Java\jdk1.6.0_25 Do you want to try to use default version ?" I tried to find where it's looking for the "jdk1.6.0_25", and updated a few config files in "C:\Program Files (x86)\NetBeans 6.7" and "C:\Users\USER.nbi\registry.xml", and yet the message keeps coming, my question is, where and what do I need to change to point it to: C:\Program Files (x86)\Java\jdk1.6.0_26? Go to Tools -> Java Platforms. There, click on Add Platform, point it to C:\Program Files (x86)\Java\jdk1.6.0_25. You can either set the another JDK version or remove existing versions. I tried this on 6.9.1. You may change the JDK per project as well. 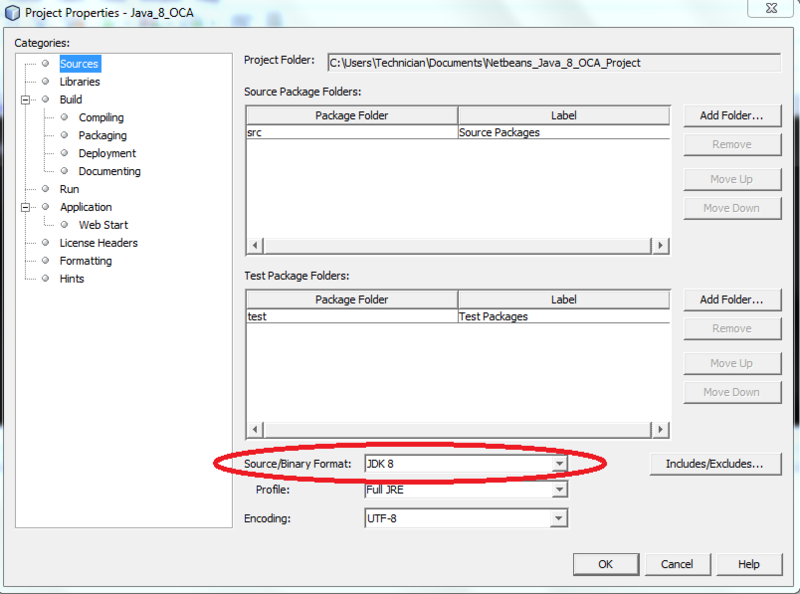 You need to set the available JDKs via Java Platforms dialog. Then, go to Run -> Set Project Configuration -> Customize. After that, in the opened Dialog box go to Build -> Compile. Set the version. you get a Symbolic Link folder that can be adjusted whenever a new JDK comes out. (in both locations for Netbeans 8) and you never have to edit the config again. Just tweak the symlink each time your JDK is updated. I had this message too because today i decided to relocate my different jdk in the same directory. I have decided to uninstall all through program manager of window. After that, of course i had the message below. "Cannot locate java installation in specified jdkhome C:\Program Files (x86)\Java\jdk1.7.0_60 Do you want to try to use default version ?" 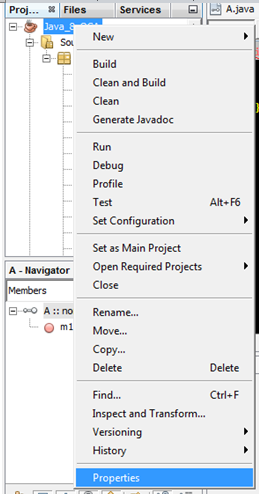 or in the shortcut of Netbeans set the above option. All the other answers have described how to explicitly specify the location of the java platform, which is fine if you really want to use a specific version of java. However, if you just want to use the most up-to-date version of jdk, and you have that installed in a "normal" place for your operating system, then the best solution is to NOT specify a jdk location. Instead, let the Netbeans launcher search for jdk every time you start it up. If you do this, when you install a new version of java, your netbeans will automagically use it. In most cases, that's probably exactly what you want. Where you already have a project in NetBeans and you wish to change the compiler (e.g. from 1.7 to 1.) then you would need to also change the Java source compiler for that project. How can I change the JDK version into JDK 10 in NetBeans? In NetBeans how do I change the Default JDK? How do I set Tomcat Manager Application User Name and Password for NetBeans?